Dr. Edalat is a certified specialist in the field of Prosthodontics which includes restorations such as ceramic/porcelain inlays and onlays. The team has an in-depth knowledge of the principles of occlusion, which has to do with the bite equilibration and harmony. This is essential for the long term success of any restorative or aesthetic procedure. One of the main advantages of Dr. Edalat’s cosmetic dental studio is that you can complete your entire treatment by certified specialists who communicate in detail all aspects of the treatment that are nterrelated for optimal results. Most patients don’t like the inconvenience of having to go to different offices to complete their work. There is the risk that the timing sequence to complete a certain treatment when it is being done at different offices may compromise the final result. Also since the work is being done in different offices there may be a miscommunication between the referring doctors which may also compromise the final result. Porcelain inlays and onlays are a better alternative to traditional amalgam (silver) or bonding (white) fillings, in cases where the decay or fracture is so extensive that a traditional filling would compromise the structural integrity of the restored tooth. The ceramic materials like Feldspathic porcelain are more similar in strength, stiffness and aesthetic qualities to the natural tooth structure compared to composite resin fillings. Inlays and onlays in some cases are better alternatives to crowns because they require less removal of the natural tooth structure compared to a crown preparation, therefore they are a more conservative approach. This is the biomimetic approach to dentistry. As these restorations are bonded to the tooth itself they help to strengthen the remaining tooth structure by holding the surrounding walls of the cavity together through the chemical and mechanical bonding phenomenon. They are superior to composite resin fillings in terms of resistance and wear to occlusal forces, protection against recurrent decay, precision of fabrication, marginal integrity, and ease of cleansing. These restorations are aesthetically superior to other filling materials as they are most often made of ceramics which do not discolor over time, as bonded composite fillings tend to do. When the biting surface of a back tooth needs a restoration, an excellent choice is often a porcelain inlay or onlay. Inlays and onlays are called “indirect restorations” because they are fabricated outside of the tooth, and then placed on the tooth in a separate step. 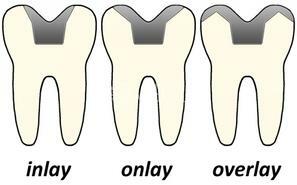 We’ll choose between an inlay and an onlay depending on how much of your tooth structure has been lost. An inlay fits within the grooves of the tooth’s biting surface, like a filling, while an onlay also covers one or more cusps of the tooth. Both kinds of restorations are precision-crafted by the master ceramist in a dental laboratory, so it may take two or more appointments to restore your tooth with a porcelain inlay or onlay. Using the handpiece, we remove any decay and shape the tooth, so it will securely hold the restoration. Next we take an impression of your teeth. The dental lab uses this impression to make an accurate model of your mouth, and then they use the model to create an inlay or onlay that precisely fits your tooth and bite. In the meantime, we often place a temporary restoration to protect your tooth. On your next visit, we remove the temporary restoration and try in your new porcelain restoration. We check the fit, and when everything is right, we bond or cement the porcelain inlay or onlay in place. High aesthetic properties that are most similar to the natural tooth structure, and colored like natural teeth. The dental laboratory along with the master ceramist and other certified technicians play a critical role in the creation of any restoration including ceramic/porcelain fillings such as inlays and onlays. Dr. Edalat communicates in great detail with his lab technicians on each case through photos, videos and when necessary taking his patients to his dental laboratory to achieve optimal results according to his high standards of care. The internationally recognised works of Dr Edalat’s master ceramist are the fruit of more than 20 years of dedication practicing and teaching at prestigious dental schools internationally, catering to the elite dental professionals and their most demanding patients, and coauthoring books on the advanced aesthetic techniques. 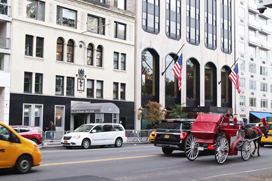 Members of the prestigious Oral Design International Foundation, The American society for Dental Aesthetics, and the Dental Laboratory Association of New York. Recognised as one of the preeminent instructors of advanced oral design techniques in the world. Director and clinical professor at the prestigious New York University College of Dentistry continuing dental education course entitled “ Mastering Aesthetics and ceramics”. Restorations seal out bacteria and restore the shape of the tooth. The type we recommend depends on how strong the tooth is and how much tooth structure has been lost. Both amalgam and composite resin fillings usually can be placed directly into the tooth in a single appointment. They work well to restore the tooth when only a small amount of tooth structure has been lost. But when a tooth has suffered more extensive damage, there may not be enough structure remaining to hold a filling in place without risk of breaking the tooth. 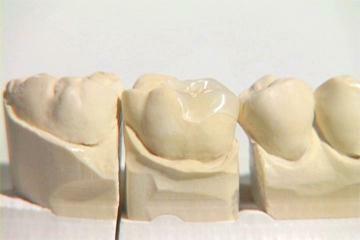 Crowns completely cover the top and sides of a tooth, protecting it and restoring its shape and function. 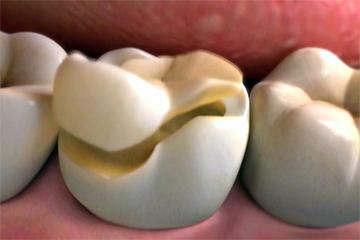 We may choose a crown when a lot of tooth structure has been lost. A crown is a good option when the tooth is weak, has had root canal therapy, is under a lot of stress from heavy biting forces, or is cracked or broken off at the gumline. 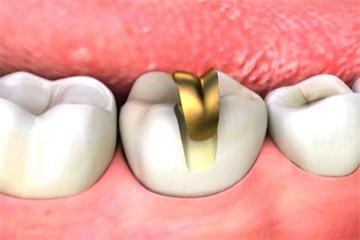 Crowns are custom crafted to precisely fit your tooth, and then they are placed in a separate step. They may take two or more appointments to complete. When a tooth needs more than a filling but less than a crown, we may recommend an inlay or onlay. Both of these restorations may take two or more appointments. An inlay fills in the area lost to tooth decay, usually in the grooves between the cusps of the biting surface of the tooth. We might choose an inlay over a filling when we need to use a stronger material or when a more durable restoration is needed. An onlay is more like a crown because it covers both the grooves and one or more of the cusps. We might choose an onlay over a crown when the biting surface of the tooth needs to be restored, but much of the tooth structure is still strong and healthy. If you are thinking of delaying treatment, you should know that tooth decay will never go away on its own. It grows slowly while it’s still in the hard enamel, but if decay is allowed to reach the softer inner dentin, it grows much more quickly, allowing bacteria to infect the pulp chamber. If this happens, you’ll need root canal therapy to save the tooth. That’s why we recommend treating the tooth as soon as possible.